There’s something to be said about losing mystique once insight is gained into a process. Let’s face it- upon seeing the man behind the curtain pull his levers, the show is basically over. Here, it’s the public foreknowledge that this issue and its immediate predecessor were once intended as one giant forty-something-page monster offering. Although the current installment’s got the “monster” part down no problem, it just doesn’t stack up the same. If last issue has a distinct “Lord of the Rings” flavor, this issue undoubtedly falls in line as mostly “extended-cut bonus features”. Sure, there’s visual spectacle galore- such as the cover-advertised rock ‘em, sock’em throwdown- but it’s also a near non-stop montage of characters on their way to doing big, important stuff without accomplishing much in the here and now (save for Peter Quill). It’s a bit late in the game for this sort of perpetual ramping-up and protracted bridge-building. Last issue made great inroads to pulling triggers and as a follow-up, this feels if not like an outright step back, then certainly a step off-balance and not landing as firmly as it should (or could). 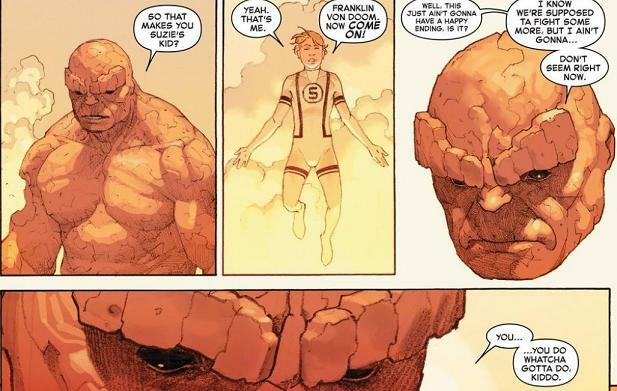 Also not without its certain “If you should strike me down, Darth” quality of an altogether different vein is writer Jonathan Hickman’s handling of Ben Grimm, The Thing. An iconic personification of the trait, Grimm is all about heart and Hickman has written the character expertly throughout the years. This is no exception as the pauses between Ben’s righteous rampage and his noble acquiesce make for a subtle yet memorable sequence. How many times can the record skip off the turntable at one party?? 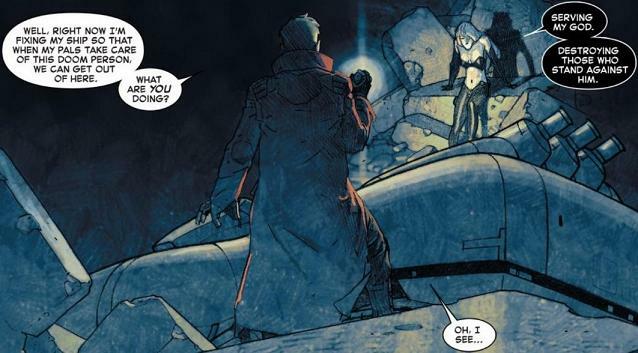 If Hickman goes a little “soft focus”, nobody told the art department, charging ahead with bombast set to “11”! When the lead image is a larger-than-life Thing taking it to flame-headed Galactus on the grounds of Castle Doom, you know you’d better bring it. And, in this, artist Esad Ribic and colorist Ive Svorcina do not disappoint. The center-ring attraction not only ties the entire affair together, its inherent kineticism even propels through the “talky” passages. Some finer details may get blurred-over in blowing out the scope but these are minor transgressions servicing Kirby creations mixing it up in a round robin that’d make Toho Studios proud- so, literally, pick your battles. Getting past the eye candy, “Under Siege” is a frustrating yet necessary piece of the Secret Wars puzzle. 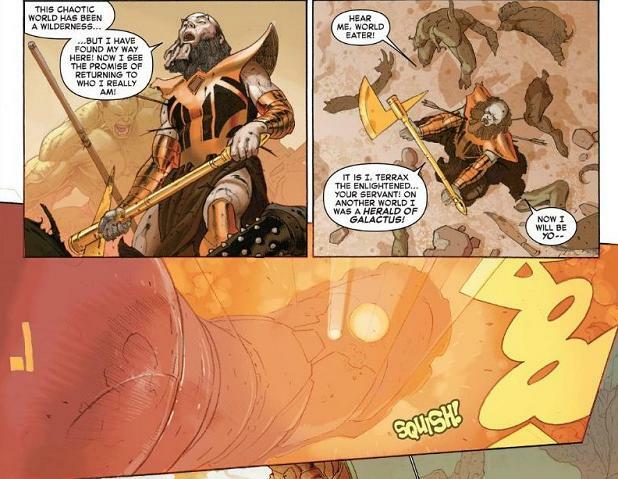 Despite a few stand-out character moments, overall pacing suffers from its formerly-conjoined status with the previous issue. One can’t help but wonder if potentially assembling a “Director’s Cut” re-examination of the pair may yield a more even and enjoyable reading experience (hint, Marvel). Consequently, it’s just that many more eggs riding on the basket of next month’s conclusion. Getting past the eye candy, “Under Siege” is a frustrating yet necessary piece of the Secret Wars puzzle. Despite a few stand-out character moments, overall pacing suffers from its formerly-conjoined status with the previous issue. I agree. 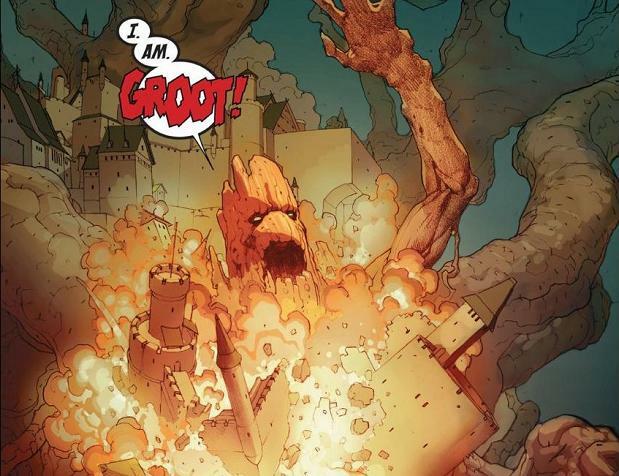 I would even say that while I liked the groot part, it had a “Easter egg” feel to it. Still good, but slightly influenced by the MCU, which is fine and I suppose has happened in writer vs screenplay forever. I’m sorry, it seems like I am always disappointed by marvel trying to a) integrate diversity and b) give characters life that will soon appear on film. Black panther. This could be handled better, like how bendis does it, or even how alpha flight did it back in the day. I loved that stuff, but this lacks real integrity or character development. Also out of the entire marvel universe its black panther wielding an infinity gauntlet? Let’s not forget that recently Hickman had captain America stumble with one. Now panther’s gonna save the day with one? Doesn’t doom have multiple ones? Idk maybe I’m reading too much into it. Still a good read and liked the thing/galactus parts as well as doom/thanos.